The rooflights that we design, manufacture and supply have a guaranteed lifespan of over 20 years if maintained correctly. 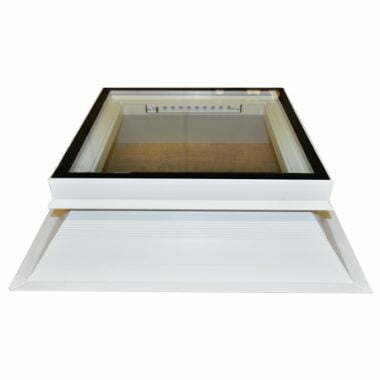 In order to ensure that you get the maximum lifespan from your rooflight – as with any fittings – we would recommend that you carry out regular maintenance. Typically, rooflights can be prone to getting dirtier as they are more exposed to elements such as air pollution, rainwater and bird dropping, in comparison to standard windows. However, they can easily be cleaned both on the interior and exterior using any standard glass cleaning solution, such as warm water with a mild detergent. We recommend that you should clean your rooflight at least once every six months using a soft cloth or sponge. Harsh cleaning solutions and hard brushes should never be used. If in doubt, always check the label of any solution you are using for further advice. Alternatively, within our range of duraglaze glass rooflight options, we offer glazing solutions with self-cleaning glass options. To find out more about this, please call our office on 01670 821166. To avoid condensation – which occurs when there is a vast difference in temperature from outside to inside – we recommend that you can do small things such as using your extractor fan in the kitchen and bathroom, and also try to dry clothes outside whenever possible. If you need any advice at all on, please feel free to call one of our team members on 01670 821166 who will be more than happy to help with any questions at all. Alternatively, drop us an enquiry at info@directrooflights.co.uk.